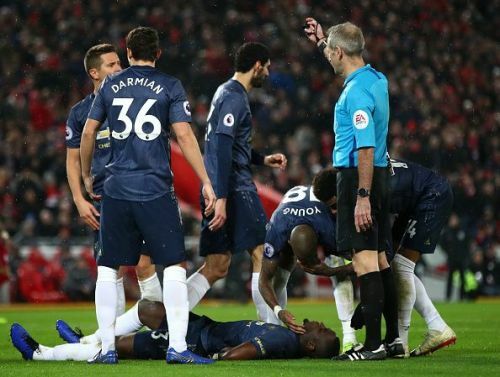 Manchester United - Down and out of the title discussion! 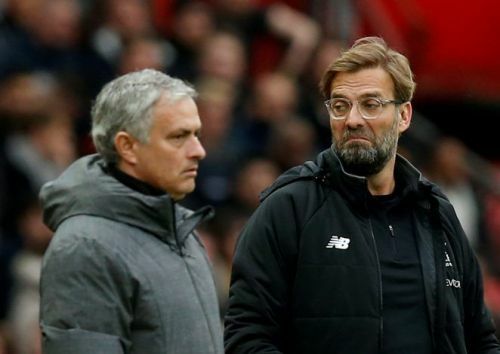 Liverpool had not won against United in their last nine fixtures and over the course of 95 minutes on Sunday, they did more than enough to win nine matches in one night. The same scoreline against two of their arch-nemesis - Manchester City and Liverpool in recent weeks has put Mourinho's United future is under doubt. The two teams stand nineteen points apart in the Premier League standings at the moment and a galaxy apart in terms of creativity, cohesion, team play, and pride for the shirt. The Reds were sharper, faster, nastier and in all honesty, much hungrier. United, on the other hand, were insipid, impotent, incorrigible and incompetent. Mourinho was placid on the touchline, probably half-expecting such gutless surrender. It is hardly a revelation to see the Reds of Manchester being gunned down this season or for the majority of the last quinquennium. Sir Alex and Sir Charlton looked indignant while former CEO David Gill and his successor Ed Woodward looked clueless and infuriated. The can clearly see the dynasty and its dominance crumbling at the moment. He could have done more for the Mane opener but that would be a stretch, considering how his team-mates will be graded and grated. He had to take the ball out of his net two more times with two deflected goals from Liverpool’s new darling Xherdan Shaqiri. Had a nightmare at Anfield. Playing as the right wing back he was constantly run ragged by diminutive dynamo Robertson and roving Mane/Firmino. The only reason he makes the team sheet is the decline of Valencia and paucity of any backups. He was deservedly hooked at half-time. Played as right side centre-back in the first half and did well in defence. Put his body on the line on multiple occasions to stem the Red tide of Liverpool as he was moved into the right full0back position. As mercurial as it gets, this was a good game from Bailly. Kept Salah honest all night and pitched in with a handful of crucial last-gasp tackles and interceptions. Unfortunately, it is two steps forward and four back with Eric and it remains to be seen how long he can keep his place in the starting eleven. Started shakily and committed a lot of turnovers through his abject Beckenbauer’s impressions. Steadied himself thereon in but the backline never looked impervious to the barrage of Liverpool’s pressure. Another committed and tough performance from the veteran. He dozed off for the opener, losing his man and giving him the freedom of entire Britain. Tidied up his errors and provided a few sparks of a fight and attacking intent along with Rashford on the United left flank. Ran a marathon in sprints. He was involved in all the bright moments for Manchester United. He and Lingard showed the Mancunian rubble but lacked the avant-garde quality that has dotted the same shirt numbers in previous teams and years. Scored the goal and created a few flutters with his mazy dribbles. However, he was too impatient and carefree and could have shown greater composure on counter attacks. He fatigued and fizzled out in the last ten minutes and was replaced with Juan Mata. United’s wounded crusader on the night as he was an example of continual motion. He was fired up and threw himself in the tackles. He was able to conjure enough calm to circulate the ball for a couple of passes before his mates gifted it to Liverpool. He was taken off for Martial after Liverpool scored their second goal. If Pogba is ponderous and slow, which he is in possession, Matic is glacial. The Serbian is not just an average athlete; he is an ordinary screen and dismal at passing. The Chelsea reject has survived the axe till now even though he has done his best to be taken out of his and United’s misery. Gave the ball away frivolously with pointless long balls and shoddy short square passes. Saving the worst for the last, to rate his performance is both easy and sad. To be savagely truthful, he was as bad as he has been for the entirety of the campaign. Indolent, weak and dispirited, the Belgian striker cut a forlorn figure in the bedlams. He was kept in the pocket of Van Dijk and more horribly for him, by Lovren too. United is fast becoming his theatre of inadequacy as his stock plummets with each outing in the shirt of the club. He did what he does best, created trouble in both boxes. He was defensively good, especially when defending corners. However, how he qualifies as a midfielder with his invalid passing ability is flummoxing reality. Come on too late and hardly touch the ball apart from a couple of knockdowns and kicks to the shins. He was United’s final substitute and an emphatic thumbs down to Pogba who sat bedraggled on the bench. He has never been good enough for the starting berth but did well on a night when his team shot few blanks and remained pinned in their own half for nearly 70 percent of the game.